Holiday purchases collection now available in the US. This collection is now available to ship to you from the US. The holidays are here & I am happy to announce that I now have a collection of jewelry available to be sent out from the US. The process is simple. Look through the collection, select the pieces you are interested in, use the contact form to send that information to me & I will notify you of it's availability. My associate in California will be shipping out your orders, via USPS for a fee of $10.00, shipping and handling. Once you have gotten confirmation from me of the availability, you can make your payment through Paypal, provide me with your mailing address and your order will be sent out within 24 hours. If you do not wish to use Paypal, please let me know and we can use another method of payment. Please scroll down this page to see the Holiday Collection! Other pieces are still available from my collection, so if you are wanting something that is not on this Holiday Page, please let me know. I can not guarantee the delivery time of those pieces & they will be sent from Jamaica, which increases the shipping costs. I am happy to be donating 10% of all my internet sales this season to a wonderful foundation here in Negril Jamaica. I encourage you to please look at their website. The Theodora Foundation For Educational & Personal Development. Contact form for holiday purchases. Hand blown red glass beads with an intricate painted on design set with a dangling cowry shell. Hangs 2 1/4 " from ear wire. Yellow jade compliments nicely this cowry shell, creating an elegant - earthy pair of earrings. Hangs 2 1/8 " from ear wire. Made for a Queen, these gold / silver Venetian glass beads are elegantly set with black and red glass beads. Hangs 1 1/4 " from ear wire. Powdery blue / silver Venetian glass paired with shades of Caribbean blue glass beads keep this Island vibe alive in this pair of earrings. Hangs 1 1/4" from ear wire. Electric lime green / silver Venetian glass beads have an Island flavor. Paired with a small shell bead and shades of green & blue glass beads. Hangs 1 1/2 " from ear wire. Red, gold & green so elegantly displayed in this combination of Baltic Amber, deep green Venetian glass and red glass beads. Hangs 1 1/4" from ear wire. Deep purple / silver Venetian glass beads set nicely with a dark purple - black crystal and finished off with a very elegant clear crystal. Hangs 1 1/4" from ear wire. Silver / Gray Venetian glass beads are so simple and elegant set with hand blown glass black beads along with small silver beads. Hangs 1 1/4" from ear wire. This purple - blue / silver Venetian glass is alive with color. Paired with a unique hand made circular glass bead and small turquoise beads. Hangs 1 1/2 " from ear wire. Soft colors of the sea and sand, this powdery blue / silver Venetian glass bead is nicely paired with soft green and sand colored glass beads. Hangs 1 1/2" from ear wire. The intrigue of leopard jasper is paired with a silvery / black Venetian glass bead and a black / bluish crystal. Hangs 1 " from the ear wire. Petite and elegant this chunk of amber is paired with a small deep turquoise blue Venetian glass bead. Hangs 1" from ear wire. Vibrant turquoise blue Venetian glass is nicely paired with turquoise round beads. Hangs 1 1/4" from ear wire. Soft and elegant, this pair of earrings is a combination of Venetian glass, turquoise & glass beads. Hangs 1 1/2" from ear wire. Oval turquoise stones paired with a piece of lime green glass bead. Hangs 1 1/2" from ear wire. Elegant and earthy, turquoise paired with coconut shell beads. Hangs 1 1/2" from ear wire. Turquoise paired with make a nice powerful balance. Hangs 1 1/2" for ear wire. Shades of green make this pair of earrings stand out. Apple turquoise paired with malachite. Hangs 1 1/2" from ear wire. Funky & fun earrings, made of turquoise & glass beads. Hangs 1 3/4 " from ear wires. Chrysoprasae & olive jade make for a stunning, earthy pair of earrings. Hangs 1 1/2" from ear wire. Olive jade, glass beads and beautifully cut crystals make for a lovely pair of earrings. Hangs 1 1/4" from ear wire. Unique, funky green glass beads with yellow stripes on them are nicely paired with coconut shell to give them an island feeling. Hangs 1 1/2" from ear wire. This glass bead with an African design in red, green & white, pairs nicely with the red coral, to add a unique flavor to these earrings. Hangs 1 1/2" from ear wire. Green agate, green jade & glass beads make for a unique dangling pair of earrings. Hangs 1 1/2 from ear wire. 2 1/2" from ear wire. Red, gold & green paired with coconut shell make these real Jamaican earrings. Made with sponge coral, coconut shell, honey jade, green jade & glass beads. Hangs 2 3/4" from ear wire. Earthy colors combined with different shapes make these elegant & subtle earrings. Yellow jade, olive jade, coconut shell, carnelian & glass beads. Hangs 2" from ear wire. Colors of a Jamaican sunset are in this vibrant pair of earrings. Made of sea shell, Balinese glass beads, coconut shell & assorted glass beads. Hangs 2 3/4" from ear wire. Three strands of iridescent deep bluish / purple glass beads are beautifully strung with Venetian glass beads in Rootbeer, purplish- blue & lime green to make this dynamic necklace. Neck opening 8"
Three strands of rootbeer color glass beads set the background for this colorful unique necklace. Strung with deep purple & rootbeer color Venetian glass beads, paired up with carnelian, turquoise, yellow jade, & assorted shapes & colored glass beads. Neck opening 8"
Three strands of rootbeer color glass beads blend beautifully with these Venetian glass beads in colors of rootbeer, silvery- light blue & purplish-deep blue, with accents of sterling silver Balinese beads. Neck opening 8"
Island meets Africa in this unique necklace. Three strands of green glass beads blend well with the earth tones, using turquoise, African trading beads, honey jade, sponge coral, coconut shell & glass beads. Neck opening 8 1/2"
Double strands of clear / silver lined glass beads are perfect for this necklace which combines so elegantly shades of greens, yellows & golds and is accented with sterling silver sun beads and clear elegant crystals. A combination of yellow jade, chrysoprasae, turquoise, ice flake, honey jade, olive jade, green agate and assorted glass beads. Neck opening 8 ½"
Double strands of black glass beads set well as the back ground for this turquoise, agate & leopard jasper necklace. Neck opening 8 1/2"
The colors of the Caribbean sea are found in this brilliant blue glass bead necklace. Double strands of blue glass beads work wonderfully with the 2 turquoise stones that are so diverse they create a perfect balance in textures. Neck opening 8 1/2"
Double strands of soft lavender - gray iridescent glass beads are a subtle back ground for this elegant necklace which is a combination of turquoise, silver Venetian glass, crystals and glass beads. Neck opening 8 1/2"
The soft double strands of rose color glass beads add charm to this elegant necklace. Strung with rose, cream & olive colors in the quartz, paired with assorted glass beads. Neck opening 8 1/2"
Double strands of clear / silver lined glass beads come alive strung with these beautiful beads of Cherry glass, turquoise, rose quartz, ice flake, amethyst, sterling silver Balinese & glass beads . Fun and funky, a great combination of Caribbean colors are found in this necklace, bracelet & earring set. A combination of turquoise, shell, hand blown glass beads and assorted other glass beads make for a wonderful conversation piece. Neck opening 8 1/2"
Funky & chunky, this bracelet comes alive with red coral, African trading beads, honey jade, green jade & green agate. Strung on extra strong clear elastic cord. A bit of African & Jamaican makes this unique bracelet one of a kind. A combination of Jamaican nickel seeds, honey jade, African trading beads and green jade chunks. Strung on extra strong clear elastic cord. Deep blue hand blown glass beads with a gold line painted on them, mix ever so nicely with the square Venetian glass beads of clear, black & copper glass. Paired with coconut shell with fabulously. Strung on extra strong clear elastic cord. These funky blue & white polka dot African trade beads set the tone for this fun bracelet. A combination of lapis lazuli, crystals, hand blown glass beads & assorted glass beads. Strung on extra strong clear elastic cord. A single strand of bead combining black, brown and three shades of green work beautifully with this pendant made of turquoise, jade & jasper beads. Length 15 1/2 ". Pink coral color glass beads are dynamically combined with a pendant made of turquoise, apple turquoise and an array of colorful glass beads. Length 19"
Iridescent turquoise blue glass beads add a touch of the Caribbean to this necklace. The pendant is a made of turquoise, honey jade and colorful glass beads. Length 17"
Iridescent dark green beads combine nicely with the stones to give this necklace an elegant jungle effect. The pendant is made of green agate, olive jade, quartz & glass beads. Length 17"
Rootbeer color glass beads with blue & lime green accents work beautifully with this pendant made of turquoise & glass beads. Length 18 1/2"
Dusty rose color glass beads are soft and make a wonderful combination paired with turquoise beads along with olive green, pink & lime green glass beads. Length 18"
An adjustable long, black , cotton cord adds to the fun of this pendant that is made with agate, Jamaican nickel & assorted glass beads. An adjustable long, black, cotton cord adds to the fun of this pendant made with, honey jade, Jamaican nickel and assorted glass beads. An adjustable long, brown, cotton cord adds to the fun of this pendant made with Jamaican nickel, ice flake, coconut shell & assorted glass beads. 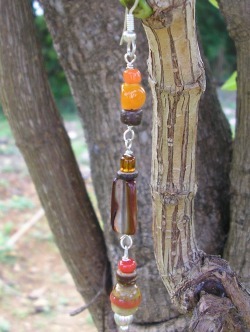 An adjustable long, brown, cotton cord adds to the fun of this pendant made with honey jade, turquoise & a glass bead. An adjustable long, brown, cotton cord adds to the fun of this pendant made with Jamaican nickel, turquoise & glass beads. An adjustable long, brown, cotton cord adds to the fun of this pendant made with Jamaican nickel, turquoise, jade & assorted glass beads.